Using the fjord walls as our GPS in the fog. The paddling was straight forward. But in this fog we had to hug the fjord walls for guidance and safety. The Narrative Report: The day dawned cold, gray and foggy, very foggy. But it wasn't raining. 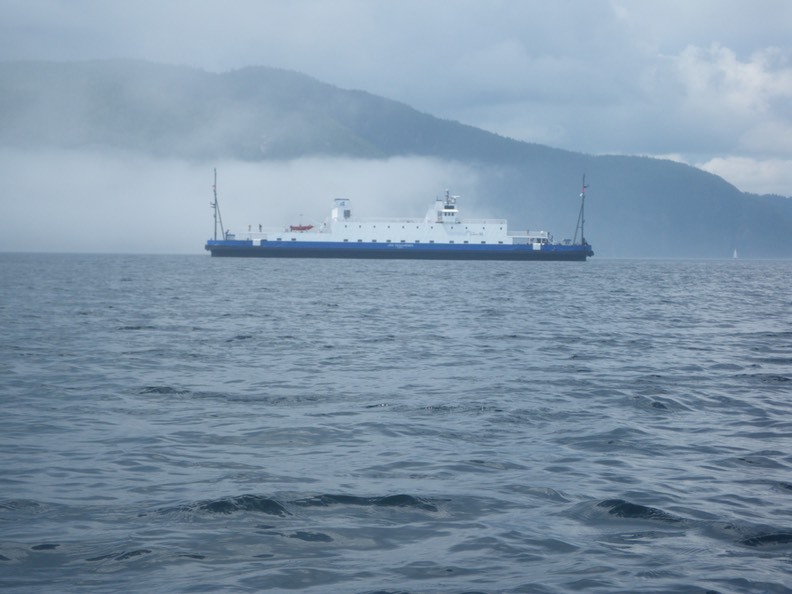 Today's paddle to Tadoussac would only be about eight miles. We were on the water at high tide and easily launched into the small bay on the south side of the pointe at Pointe Passe-Pierre. The dense fog kept us close to the fjord walls again, becoming our granite GPS. The fog was strange. It descended over the top of the fiord walls and poured down the valleys like vanilla pudding onto the river. It settled like a cold damp blanket on top of us, chilling us through and through. And then we'd come to an unexpected clear area and paddle into a heavenly warm spot. But after too short a time we'd be back into that shroud of fog feeling the cold chill of death breathing down our necks. Rounding a rock outcropping we surprised a group of harbor seals resting on a low ledge. They were in the water and gone immediately. But seals are curious, so they continued to pop up to check us out for some minutes before they disappeared for good. We unexpectedly came across a group of seals on a low rock outcropping. These were the first seals I'd seen in the fjord. we watched them play in the water for some time before moving on. This video is best watched in full screen mode as the seals in the video are some distance from the camera. The fjord walls were so sheer and the drop off so severe that there was no place to take a shore break until we came to a little cove (near the area marked "Cave" on the first map). This was a beautiful spot with clear blue skies, a few puffy white clouds and sunshine, while out on the river, fog reigned supreme. From this pleasant cove it was a short hop to Tadoussac and the second and third most treacherous parts of the trip. There is no bridge spanning the fjord along its entire length. There is no bridge linking Tadoussan on the north side with Baie Sainte Catherine on the south bank. The Canadian government has solved this problem with a free ferry service. These ferries run run every fifteen minutes, so it is important to time your crossing of the terminal entrance carefully. 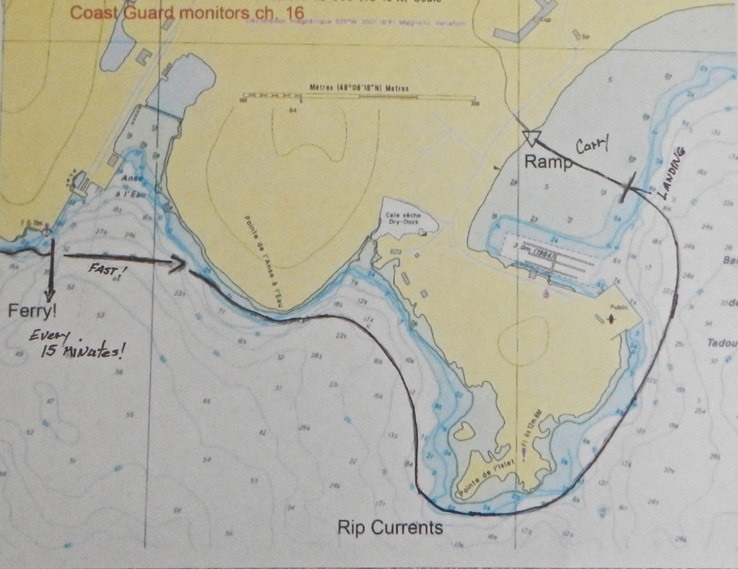 This is a blow-up of the approach to Tadoussac (see the inset box at the lower right on the map above). There are two spots that need attention here; the crossing of the entrance to the ferry terminal and the rip currents at the point. Just north of the terminal is a large rock that has the frame of a sign on it. It had a warning sign in 2009, but only the frame remains today. It is important to pause here and time the ferries. Be aware there can be a strong current here pulling you across the terminal entrance. We experienced this in 2009, but there was little current on this day. Wait for one ferry to leave while another docks, then make your move. Paddle like crazy to get beyond this point. The next area to watch out for is marked "Rip Currents" on the map. This area can get turbulent. The water is shallow in places so you need to stay well off for safety. 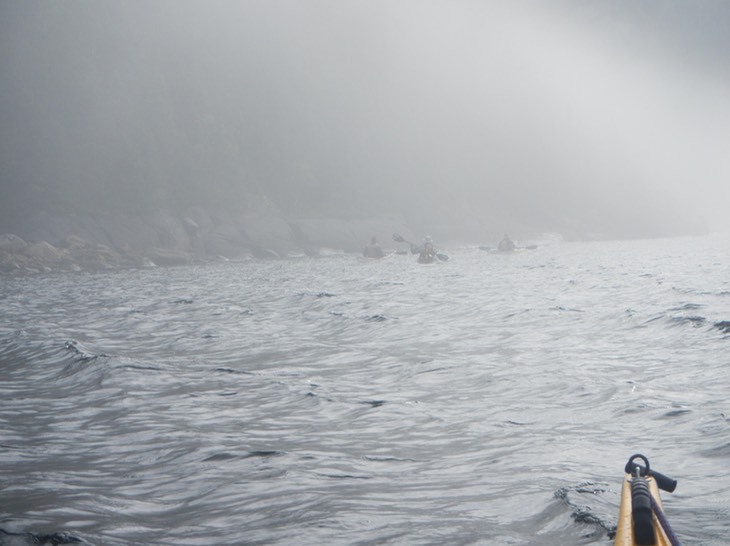 The last day of our trip was paddled in dense fog. 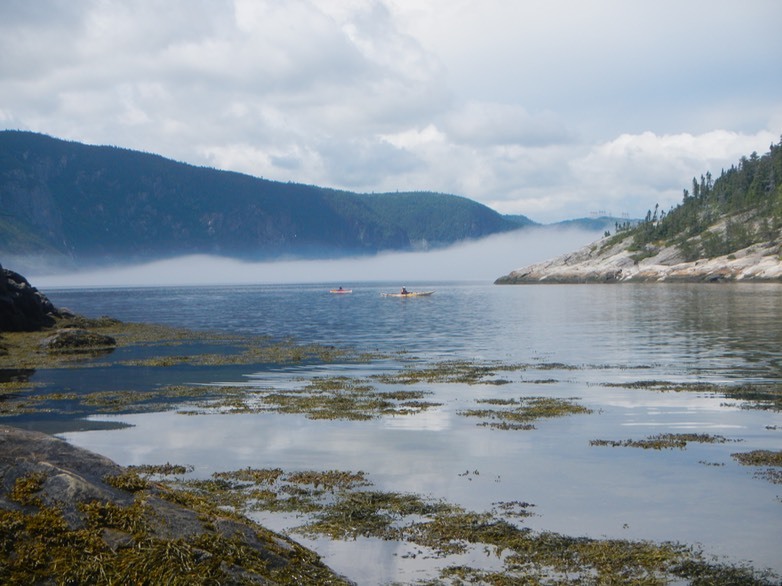 We hugged the vertical walls of the fjord to avoid getting disoriented and lost as we paddled south toward Tadoussac. Out on the fjord we could hear the occasional water taxi passing by, unseen. 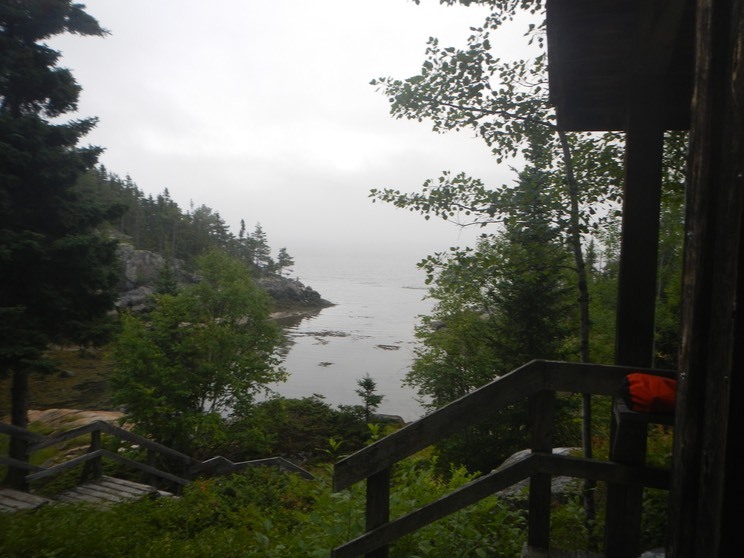 Finally, we reached Tadoussac and the end of our adventure. The rest should be easy. Keep on rounding until you see the marina. Paddle parallel to the marina and land on Tadoussac Beach. 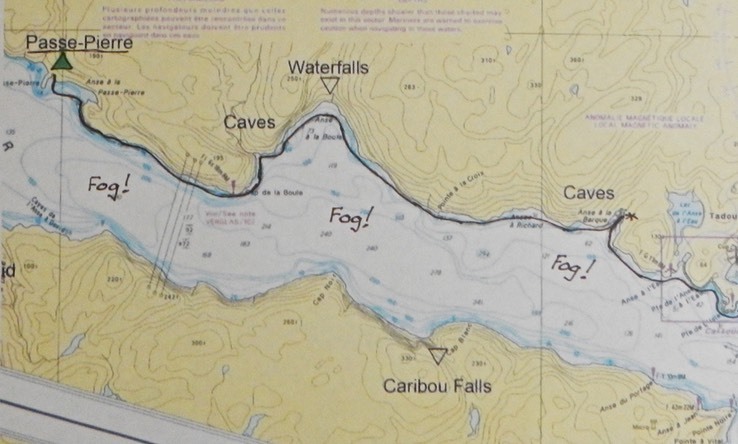 It should be easy, unless you are paddling in dense fog and can't see the marina. You can hear boats moving in the area, but you can't see them either. Very nerve-wracking. Finally, Tadoussac. The rest is just housekeeping. Kaare called for the guide to come pick up the drivers of our three cars. We all began to unload our gear and prepare to get it into our travel bags. 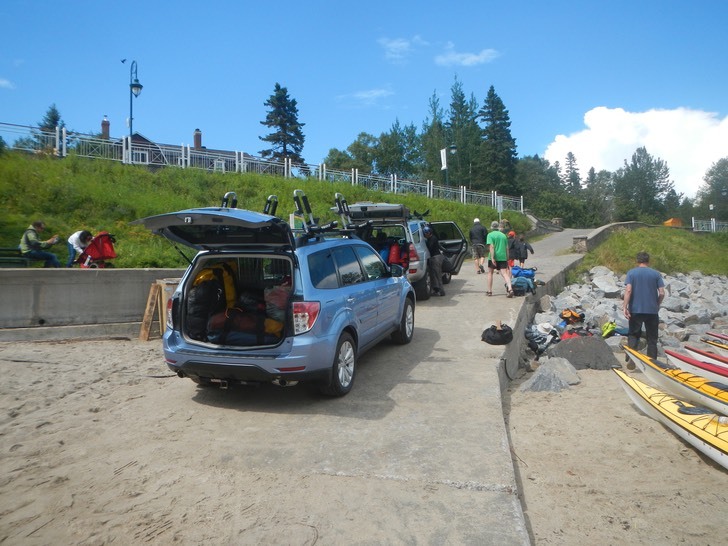 Then the drivers went to retrieve the cars while we continued with repacking. Robin made an unsuccessful foray for ice-cream while Bruce and I tried to protect the exposed gear from the stray rain showers that kept passing through. Finally, the cars arrived. Boats and gear were packed. Tom left immediately for another engagement while the rest of us found a pleasant restaurant where we sat outside and shared a last meal together before heading our separate ways - Robin and Kaare to a family reunion, Scott, Bruce and I for home. Notes on the camp at Pointe Passe-Pierre: The camp at Pointe Passe-Pierre is old and well worn, yet very comfortable. Most of the platforms have been there a while and the cooking pavilion must have been one of they first they built. Vertical access to the site is better than most through a well constructed stair system. And unlike all the other camps we visited, this one had eight or nine (maybe more) tent platforms. 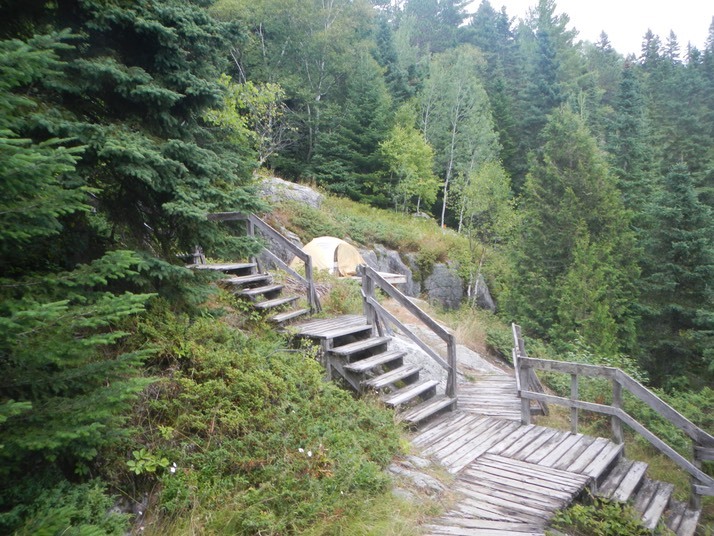 We think this is because Pointe Passe-Pierre is a favorite with local guides and overnighters who want a small wilderness experience just a short distance from Tadoussac. As reported earlier, the landing at this site can be difficult unless approached from the south side of the point, above low tide. Approached from this side, access is much easier and the view from the cooking pavilion and forward platforms is spectacular. The video below will give you a quick look at Pointe Passe-Pierre. For some reason I never shot a video of the camp at Pointe a Passe-Pierre. It was a lovely if well worn camp. Being so close to Tadoussac made it easily accessible to overnighters. To accomodate the demand, this camp had eight or more tent platforms instead of the usual six. Here is a Ken Burns style slide show about the camp.